A fresh and extraordinary book – Another Travel Guide Riga – is being released this week. The full panoply of the city’s beauty and eight centuries of a complex history that’s still vibrant and alive are unveiled in a creative and appealing manner. Both its eclectic style and various modern accents are showcased, as are different exciting phenomena generated by artists, designers and other talented Riga residents. It’s a guide to the best hotels, museums, cultural facilities, cafés, restaurants, shops and local habits, but it’s also a book of unusual artistic value. It unveils a great city with a different and creative visual approach. 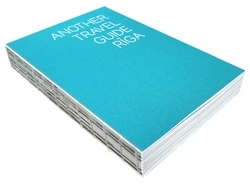 A fresh and extraordinary book – Another Travel Guide Riga – is being released this week. In recent months you may have heard various stories about the Baltic states and specifically about Latvia. In light of the global economic crisis, these were probably not the most positive reports. There are, however, a host of fascinating features that make Latvia and especially its capital, Riga, the largest and most cosmopolitan city in the region, a terrific travel destination. There’s even a silver lining to the economic troubles; prices have dropped significantly since the boom, making the remarkable restaurants and hotels, the stunning exhibits in the museums, and the many unusual and enticing tourist attractions a great value. The full panoply of the city’s beauty and eight centuries of a complex history that’s still vibrant and alive are unveiled in a creative and appealing manner in the fresh and extraordinary book – Another Travel Guide Riga – that is being released this week. Both Riga’s eclectic style and various modern accents are showcased, as are different exciting phenomena generated by artists, designers and other talented city residents. This is not the typical glossy guidebook that nearly every city in the world has on offer. This is something different – an insiders’ look not only at the main sights but also at unknown, mysterious or romantic places in and around Riga. With artistic flair, the authors share their best secrets and reveal the special places they’ve come to love the most to those who want to discover the real Riga and its hidden attractions. Simply put, Another Travel Guide Riga offers a completely different look at Riga that sets it apart from ordinary guidebooks. Readers are encouraged to experience the city’s diversity, starting with its iconic sites and ending with charming places on the periphery that tourists almost never see. Those places known and adored by true insiders are a central feature. The book is available in English only. Its authors are the fashion and travel journalist Una Meistere, the art critic and curator Daiga Rudzate, and the artist Kirils Kirasirovs. The guide is being published by the Internet magazine for independent travellers Anothertravelguide.com and the Indie cultural projects agency. “Riga has long lacked a guide that shows the Latvian capital city as multi-layered, modern, pulsating and dynamic. It’s a city that’s thrilling to live in. There’s now an even greater need for this book because Riga has really come back to life of late. The fake glamour of the boom years has fallen away, but Riga’s creative potential is more powerful than ever. We see this in the ‘creative islands’ that are scattered all around town. Riga can really inspire and surprise, but whether and how it does depends on one’s viewpoint and the desire to see new things,” says Una Meistere, editor-in-chief of Anothertravelguide.com. The team which put together Another Travel Guide Riga is made up of true insiders – artists, architects, businesspeople, journalists and photographers who love the town the live in. It’s a guide to the best hotels, museums, cultural facilities, cafés, restaurants, shops and local habits, but it’s also a book of unusual artistic value. It unveils a great city with a different and creative visual approach. “The book is our attempt to tell a story about the city we are so intimately a part of. This is not a list of formal instructions for tourists composed of plain signs, images, symbols and places. Our aim is to reveal the real Riga and the identity of its people. We want to show readers the city we love. Even when seen from above through an airplane window, the city holds emotional power and radiates calm at the same time,” says art critic and curator Daiga Rudzate. The new guide is available on Amazon.co.uk and information on other places to purchase it is updated regularly on the Riga travel guide’s website. The book is going to be available off-line in various shops, hotels and restaurants around Riga and sold in Vilnius, Tallinn and Helsinki as well.